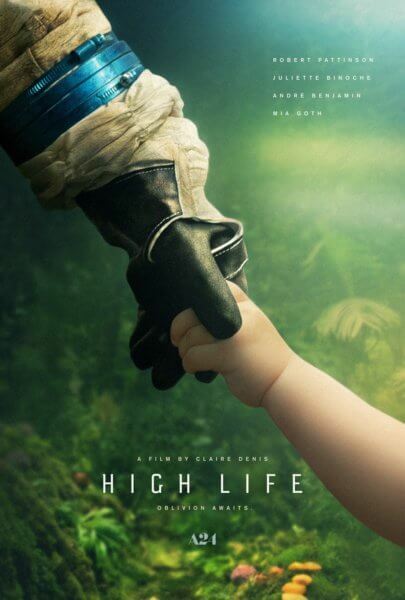 A24’s first official U.S. trailer for High Life introduces a mad scientist and her inmate subjects in space. The sci-fi thriller marks the English language debut of writer/director Claire Denis (Un beau soleil interieur, Les salauds). Denis co-wrote the script with Jean-Pol Fargeau, Geoff Cox, and Nick Laird. Juliette Binoche (Clouds of Sils Maria, Ghost in the Shell) plays the mad scientist and Robert Pattinson (the Twilight films, The Lost City of Z) is one of the inmates. The cast also includes André Benjamin (Idlewild, Smokin’ Aces), Mia Goth (A Cure for Wellness, The Tunnel), Lars Eidinger (Sense8, Babylon Berlin), and Jessie Ross (The Frankenstein Chronicles). Claire Denis’ behind the scenes team includes editor Guy Lecorne, costume designer Judy Shrewsbury, and cinematographers Yorick Le Saux and Tomasz Naumiuk. Laurence Clerc, Oliver Dungey, Christoph Friedel, Andrew Lauren, DJ Gugenheim, Claudia Steffen, Olivier Thery-Lapiney, and Klaudia Smeija served as producers. The sci-fi film’s an Andrew Lauren Productions, Apocalypse Films, Alcatraz Films, Pandora Filmproduktion and Madants production. A24 is planning an April 12, 2019 theatrical release.